Walter Foster Jr, 9781633225077, 128pp. First learn how to get inspired and how to inspire others, as well as the importance of embracing diverse perspectives and how to handle conflict diplomatically. Then discover how to channel your inspiration into creative outlets, such as organizing community events or meetings, using social media to affect change, and contacting your government representatives. Also get some great tips for generating creative ideas, running for office at school or getting involved with local government, and what to bring to protests. 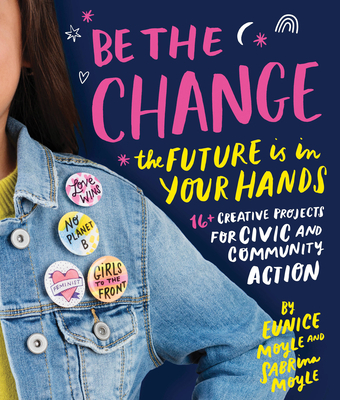 Once you learn about what it takes to effectively “be the change,” follow along with the simple step-by-step projects to promote your ideas and events, from protest posters and fundraising jars to iron-on tees and stenciled tote bags. With a little creativity and a positive outlook, you too can inspire change in the world! Eunice Moyle, co-author of Happy Mail and Be the Change, is one half of the sister entrepreneur team who started Hello!Lucky, a San Francisco-based design studio founded in 2003. Hello!Lucky’s playful and punny designs have reeled in numerous awards and have been spotted in retailers worldwide. When Eunice isn’t anthropomorphizing everything from bananas to unicorns, she enjoys spending time with her children. Sabrina Moyle, co-author of Happy Mail and Be the Change, is one half of the sister entrepreneur team who started Hello!Lucky, a San Francisco-based design studio founded in 2003. With its pun laden and playful designs, Hello!Lucky has worked with retailers around the world. When Sabrina isn’t hard at work designing award winning products, she is enjoying time with her children and her sister Eunice and her children.